Dawn is a NASA probe, launched in 2007, to examine the two oldest and largest asteroids in our solar system: Ceres and Vesta. This could help answer some questions about the formation of the solar system and the role of size and water in the process. 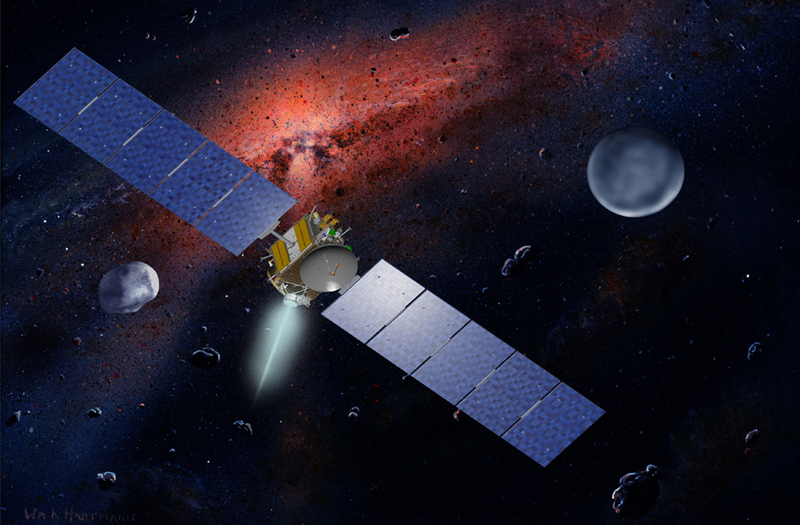 Dawn will measure the exact mass, shape, and spin of the two asteroids from orbits 100 to 800 km high, record their magnetization and composition, use gravity and magnetic data to determine the size of any metallic core, and use infrared and gamma-ray spectroscopy to search for water-bearing minerals. The ultramodern propulsion system with the ion-powered engine requires powerful solar arrays to supply the required amount of energy to work. The configuration consists of two wings of five panels each. Each panel is 1.6 x 2.2 m. In total, they are covered with nearly 13,000 state-of-the-art gallium arsenide solar cells. Together these are capable of delivering more than 10,900 watts at the beginning of the mission when the panels unfolded after launch. Airbus Defence and Space Netherlands (then called Dutch Space) was responsible for the design and building of Dawn’s solar arrays.